I WILL make a turkey for my son for Thanksgiving. Even if I’m wailing during the whole process. Even though my son and and I will be feasting elsewhere for the holiday. I will roast a turkey. I want to have a huge platter of bird in the fridge. A plate full of turkey in our own home means we are okay, that our tiny family is surviving, that life goes on. This will be my fifth Thanksgiving without my daughter. I’m learning how to handle it. Remembering Marika in the kitchen tearing breadcrumbs for the stuffing and baking carrot cake, I’ve learned that one can simultaneously grieve and be grateful. Last year I called it Thanksgrieving. 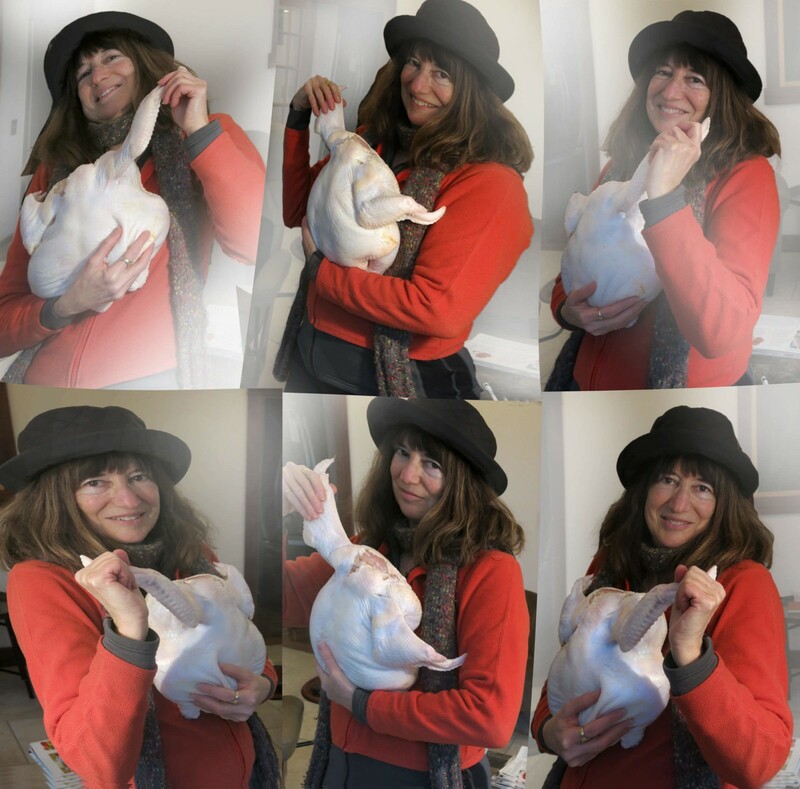 This year it is Dancing with Turkeys, as I dash all over town to dine in three different households before coming home to the turkey in my fridge. Treat yourself like you’re the guest of honor. Our beloveds won’t be seated at the table but they are seated in our hearts. So carry on the way they would want and be good to your self. Allow yourself to cry. Let the pain gush out in tears. Pull out old photos, phone your sister in Florida to reminisce, chop onions, and cry like a lemon being juiced. Allow yourself to smile, maybe even laugh, at the memories of sweet times. Remembering and making memories are the real gifts of holidays. Focus on what you have, not on what you’ve lost. What are the lessons you learned from your loved one? What was gifted? What has changed your life? If you can’t find something to be thankful for, do something nice for another. The most joy can come from giving someone else something to be grateful about. So go do this holiday, my friends. Whether you gather with others, or chow down your dinner standing alone over the kitchen sink, I am sending you my warmest wishes. We are going to be okay. We are surviving. Life goes on. You are not alone. How do you grieve and be grateful at the same time? This entry was posted in 2015 and tagged dancing with turkeys, gratitude, grief and holidays, grieve and be grateful, holiday tips for grievers, Thanksgiving, thanksgiving survival on 2015/11/23 by Robin Botie. Wonderful, Robin. I think dancing with a turkey is the best idea I’ve seen. And Thanksgrieving. And gratitude for what is. You’ve dealt with it all with a touch of terrific humor. I look forward to sharing this one tomorrow. Love to you as we get through another Thanksgiving with too many missing. Too many missing – yes, Elaine. And luckily, the sense of humor shows up in weird but timely ways. You are fortunate to have a brother and a few friends that will dance with you when you get the urge to dance. Sometimes one can’t be choosy about her partner (it was actually a good-sized chicken). Cheers! 5 years of Thanksgiving without Marika. The cement shoes of grief are freaking heavy but there you are doing your best to dance and holding a … how many pounds is that bird? You could have titled your post “This Suxs!” but I like what you’ve written far better. Thank you for your hope Robin. It truly helps the grieving heart. Actually, Susan, I’m reading Brenee Brown’s new book, RISING STRONG, and so I really need to consider writing the “This Sux” article, even if I don’t actually post it. Hope. Hard to recognize sometimes. But I guess it’s still there. Wishing your grieving heart, and mine and everyone else’s, some peace and warmth. Cheers! I hope you had a great one too, Annie. Pomegranate fizz with Campari – thanks for that. Cheers!